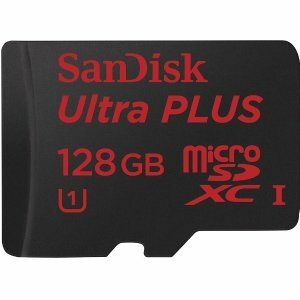 Best Buy offers the SanDisk Ultra 128GB microSDXC UHS-I Card for $19.99. Features: Capture, carry and keep more high-quality photos and Full HD video on your Android smartphone or tablet or compact point & shoot camera with up to 128GB SanDisk Ultra microSDXC™ UHS-I card in the slot. Transfer pictures and videos from the card to your PC at a no-wait rate of up to 80MB/s.